Nearest airports are Nice (1hr 15) and Genova (1hr). We find Ryanair from Stansted offer the cheapest flights from London. From Genova, exit the airport heading for A10 Autostrada (there are directions). After the toll booth, turn sharp right into the tunnel, direction Ventimiglia. Continue for around 40 minutes. 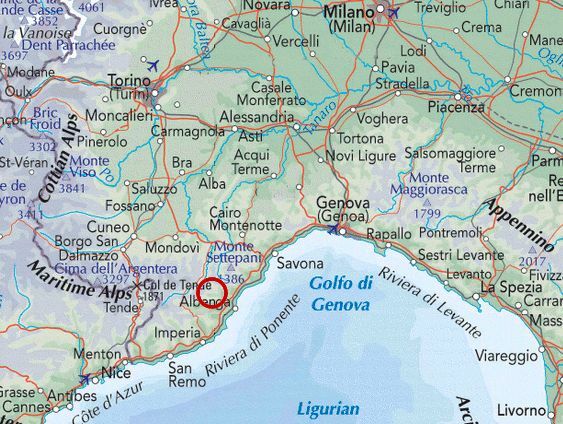 Take the Albenga exit on the GENOVA-VENTIMIGLIA motorway. Follow the signs towards Garessio and Castelbianco 11km (this is a sharp left and a tricky junction). (If you want to stock up on groceries before heading to the village, turn right towards Albenga and follow signs for the Co-op). 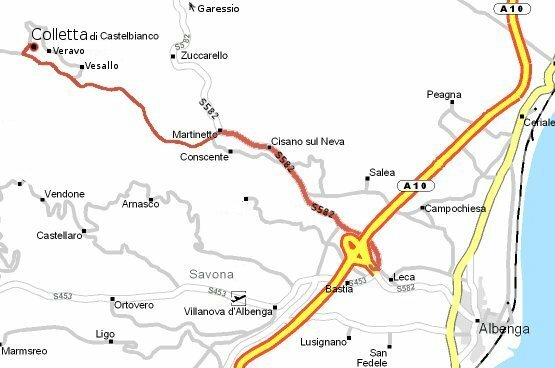 Pass under the motorway bridge and at roundabout go straight over, direction Castelbianco 10km. Pass the small town of Cisano sul Neva on left (this is a great place to stop for shopping  but everywhere is closed 12.30  3.30pm and all day on Sunday). 1.5km later, at Martinetto, turn left at the Esso petrol station in the direction of Castelbianco-Nasino. Carry on road for 4km. Pass Farmicia on right and then Ristorante Scola on your right. Turn immediately right and follow the hill up. In about 300m you will see the small church of Saint Lucia on your left and the sign annoucing Colletta on your right. The parking lot is a little further on, on your right. Walk down the cobbled street past seating area on terraces on the left and the last green door on the right is Flat Funtanin. After that is the centre of the village and the bar. Check website www.colletta.it for bar and pool closures.